Cash flow is king, under estimating the cost of owning a property in the long run can lead to disaster. Use a business like approach. If you bought at the right price and can manage your cash flow you should do well long term. Ensure you are aware of the rents in the area of your purchase. What is the vacancy rate for that area or type of dwelling in that area? Look after your tennants however be aware of current market rentals. Do not overprice your property. Be ware that tennants may apply as a couple and then have others move in with them (not necessarily legal). There are also situations where if other units or houses nearby are paying less for rent your tennants may resent you or leave as soon as the lease is up. Rent Increases Telstra recently introduced a charge for paying your bill as you have always done. The literature sent out said something like "to avoid a bill charge pay online automatically". Not hey we are going to charge you because we can. Small regular increases may prevent the shock and awe of a one off $40 a week charge. Some advisors say it is inadvisable to switch for around 20 basis points. Buyers can shop around and receive up to 1% discount off published loan rates. 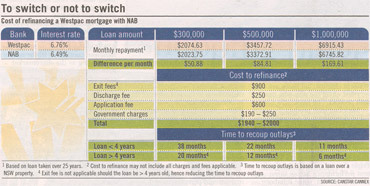 This calculation is useful to determine your monthly repayments. Principal is the amount you borrow e.g. $150000. Years is the length of the loan in years e.g. 20. Interest Rate is the interest rate charged by a bank or financial institution e.g. 7.5. This calculation finds the future value of an investment. Years is the length of the investment in years e.g. 20. Compounding Periods per Year how often the interest is compounded. Use this calculation to help determine if you are better off investing in real estate or with shares or a bank deposit. Amount of Payment is the amount paid per month. Number of Payments Made this will be 1 for every month that payments have been made. Interest Rate the interest rate charged by the lending institution. Remaining Balance the amount left on the loan. Use this calculation to help determine how much you owe on your loan. Notice how a slight increase in the amount of Payment has a dramatic effect on the remaining balance.